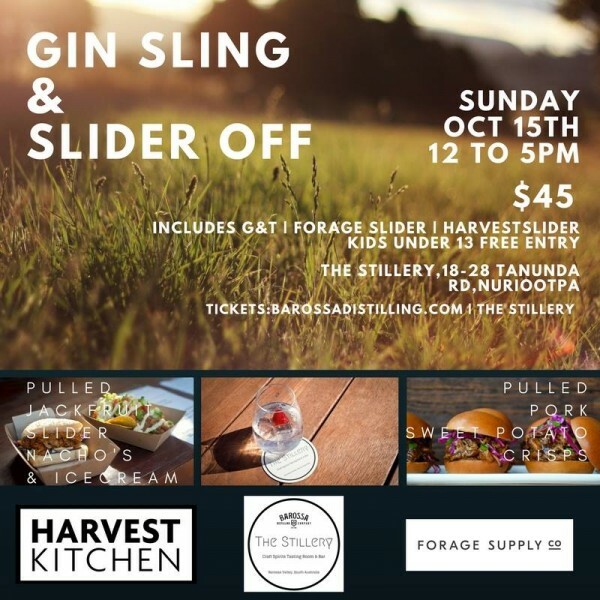 Barossa Distilling Company, Forage Supply Co & Harvest Kitchen have come together to bring you the Gin Sling & Slider Off! On Sunday 15 October, Forage Supply Co and Harvest Kitchen will be going head to head with their sliders - whose will be voted the best? Forage Supply Co. are going into bat with the ground breaking Pulled Jackfruit Burger and Harvest Kitchen are bringing their A-Game Pulled Pork Burger. They will also have nachos, sweet potato crisps, dairy free ice-cream, brownies and more. Barossa Distilling will have all your beverage needs covered with their fabulous Gin, incredible cocktails, other craft spirits, beer, wine and soft drinks. Ticket price includes entry Gin & Tonic, Forage Slider (Pulled Jackfruit) & Harvest Slider (Pulled Pork). Other food items available for purchase. No ticket purchase required for kids under 13, food purchase available on the day. Soft drink available as an alternative to the entry G&T. This is a family friendly event with cricket and other games set up on the grass area.